I'm not a fan of Chinese cuisine, if I'm honest. Chung Ying Central, however has swayed me somewhat. It has only been open for a few months but it is definitely making its presence felt in Colmore Row, bringing a slice of Chinatown into the heart of the city. If you're not familiar with Colmore Row, it's the business district of the city, and is commonly called Colmore Business District simply because it is where a lot of offices and HQ's are situated. Sandwich shops, taekaways and cafes are rife in this area - people want 'grab and go' food, so it was a surprise to find Chung Ying here. Nonetheless, my colleagues and I thought we'd give it a try, seen as it was new (ish). 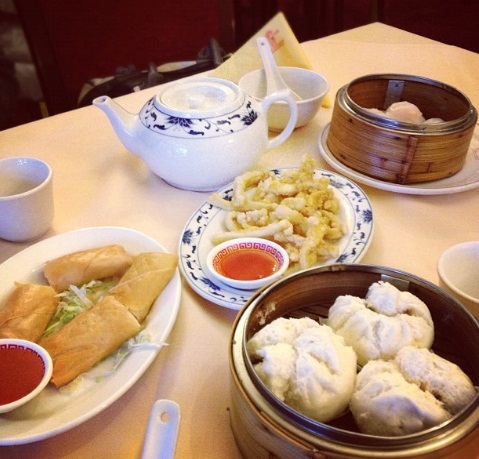 The food, particularly the dim sum, is excellent and the express options at lunchtime are great value. I paid £8.00 for a meal and drink, which is cheap compared to the eateries in the Colmore Row area. The staff are genuinely speedy too, so totally do-able in a lunch hour. If you're not hungry don't worry because it's not your average restaurant where eating is a must. You can also pop in just for drinks – we stopped by last week and discovered a brilliantly inventive cocktail menu and what is surely the best selection of Asian beer in the city (or so my friends tell me). I opted for the mango juice and water, fairly priced at £2.00 each. Not bad for a city centre location.